My first perfect cup of tea was at the Westin Moana Surfrider Hotel in Waikiki, Oahu. High tea on the veranda under a century-old banyan tree is always a highlight of our trips to Hawaii. The hotel itself is reminiscent of old British colonial glory days, it is absolutely beautiful and often referred to as the “First Lady of Hawaii”. During tea service, a dozen or so dried, exotic teas are presented for you to sniff and make a choice as to which one you want served. Before you know it, scones accompanied by lemon curd and Devonshire clotted cream along with other she-she-la-la pastries and elegant finger sandwiches are served. It’s civilized, snobby and a complete splurge all in one. But this is where I fell in love with the act of afternoon tea. When we were back home, living in Southern California, our neighborhood bordered the Ritz-Carlton Laguna Niguel, another amazing place to experience high tea. Needless to say, high tea at a fabulous hotel is a great way to spend an afternoon. But that was back in the glory days…. Now…home in Oregon….where we spend our days tending to a vineyard (farming) and other less glamorous tasks of the wine business…tea remains an essential, wonderful way to come together on the many cold, damp and very wet Oregon afternoons. However, I am not a loose tea person, I just don’t have time or the patience to mess with the steeper and the wonders of loose tea. Oh, if someone else is doing it then by all means bring out the exotic loose tea. But for now, God bless tea bags and all the wonderful flavors they are continually coming out with. 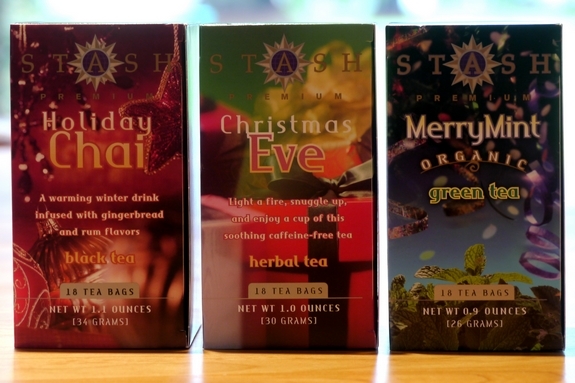 Just yesterday I picked up the new Stash holiday teas at the market. Look at all amazing flavors, I can’t wait to try them all. Anyway, back to that perfect cup of “tea bag tea”. Of course tea purists will argue that tea bags are inferior to loose tea, as they are only the leftover dust and scraps of the higher quality tea leaves. I’m okay with that. I need the convenience. First, always, always start with cold water. It retains more oxygen and gives a fuller, rounder flavor. Do not use hard tap water, instead try bottled or filtered water. Also, do not fill up your teakettle the night before, always use fresh water. While your water is heating on the stove, warm your teapot by filling it up with very hot tap water. Leave the water in there until your other water is ready. Then drain the teapot completely and fill it with the water from the stove. Lightly dunk the tea bags (I use two tea bags per teapot for brewing) into the teapot. 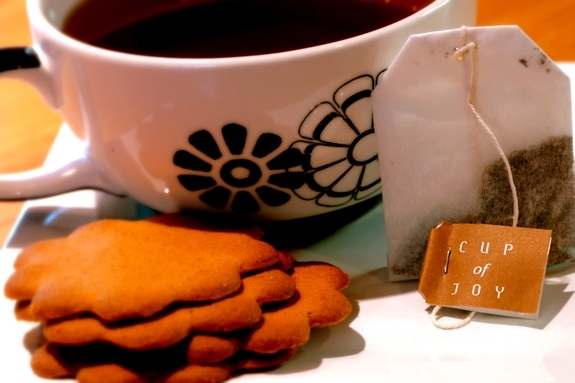 A big faux pas when making tea, besides the incorrect temperature of the water; tea bags are dunked and then squeezed out the tea bag. Squeezing out the bag makes the tea bitter. I can still see my grandmother wringing out the tea bag into her cup as she tried to get every last bit of tea water out. Then adding copious amounts of sugar to the tea to overcome what I’m sure was a bitter taste. Don’t do that. Do not touch the tea bag once it’s in the cup or teapot, until it is time to remove it. For black tea, you want to bring the water to a full boil but remove the teakettle off the heat as soon as the water begins to boil. Continuing to boil the water boils all the oxygen out and the tea actually has a flatter flavor. Brew the tea for 4-5 minutes. When it comes to green tea, white tea or herbal teas, which are more delicate, you want to remove the teakettle from the heat right before the water comes to a boil, about 170 degrees F. Brew the tea no more than 3 minutes. Overbrewed tea will also taste bitter. Do not leave the bag in contact with the water longer than necessary. If you don’t have a teapot, I highly suggest getting one if you regularly make more than one cup of tea. I picked this one up at a tea shop in San Francisco. I loved the color and its simple design. Are you looking for a simple gift for the holidays? Head to the thrift store and you will find a plethora of homeless tea cups and mismatched saucers. 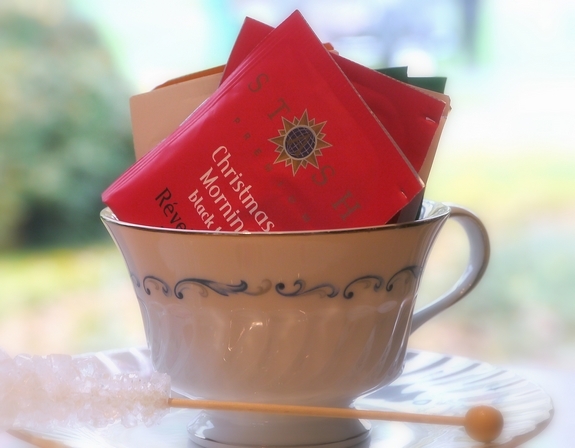 Fill them with holiday teas and wrap the cups and tea up in cellophane, tied with beautiful ribbon. This is perfect for co-workers or any other situation where you have lots of individuals you want to show appreciation for around the holidays. You might even include this with a tray of homemade cookies. 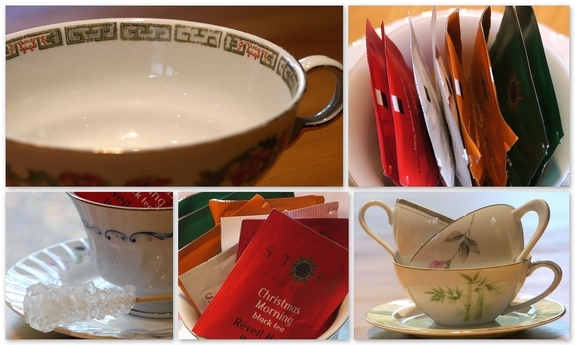 As a transplanted Oregonian to England for the last 30 years I am a die hard tea drinker. I love it the English way, with milk. No sugar please. I use tea bags and am 100% happy with PG Tips brand tea bags. It brews a proper cup. The only thing I would disagree about in your tea making ritual is that I do use tap water straight from the tap. It is fine. In fact different areas water here in UK will make the tea taste different…like the soil is to grapes. I loved the way tea brewed in Isle of Mull. The water is very peaty and the tea was wonderful made with their water. No doubt someone will disagree with me about tap water but in my book it is just fine. Going out for afternoon tea in London is a very expensive outing but one that I and my girlie friends still enjoy doing. Look at the afternoon tea available at The Langham Hotel in London. Voted best afternoon tea place 2010. Tres posh and lovely! Cheers. I never knew that about squeezing a tea bag. I’ll stop doing that from now on. I’ve done tea there and it was wonderful! I love tea time and use bagged tea. The water really makes a differnce as we have hard water in our area. I have to find those holiday teas! Oh my I always squeeZe out the bag. I will stop that now! Love this post! This guide will now be bookmarked and referenced nearly on a daily basis until memorized. Thank you so much for all this tea insight. I loooove tea! Now will you post your favorite recipe for scones to go with it? Thank you! Love this blog. i grew up in an obsessive tea-drinking family (my parents are both british) and have to say that all your suggestions are spot on with how they taught me to make tea! although they *do* squeeze the tea bag to get the extra tea out of it. i’ll have to try not doing that and compare how it usually tastes. I love your blog, and have made many of your recipes! This is probably my favorite post, because I love tea. I am pregnant with my second child and herbal tea is my favorite morning drink. I didn’t know how to make it with a teapot though…or I don’t own a teapot either. I will have to get one! 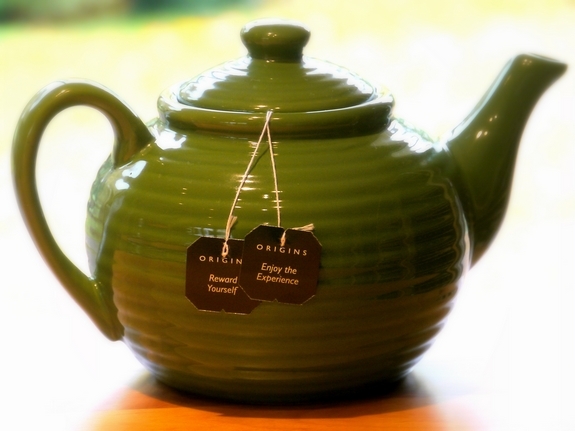 I LOVE tea – Just finished a cup of Pomegranate Green Tea :D. What a way to kick off my morning. Thanks for the tea tips. Have you tried the tea service at the Scarlet Tea Room in Pasadena? I haven’t had scones that amazing since I visited London. 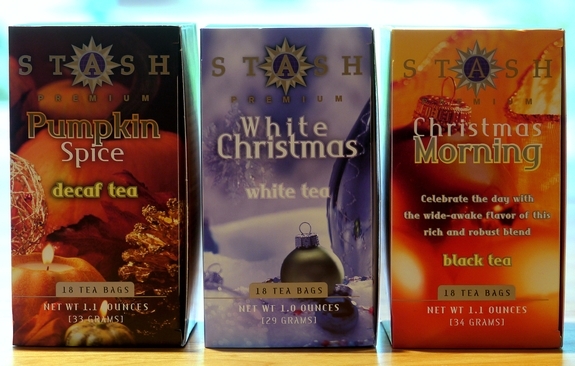 Where did you get the Christmas teas? I love trying new teas and I live in the Portland area. I would love to know where you got these teas so that I could try and pick some up to try for myself. White Christmas is the one I like to stock up on. Like many others on here, I’ve been squeezing my tea bags for years. I’ll be sure and stop. But I also learned that you’re always supposed to pour water over the teabag instead of dunking… what do you think? 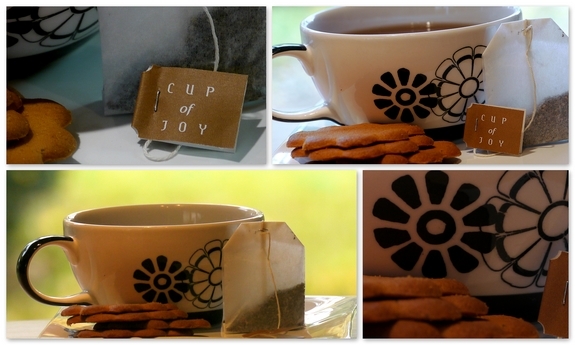 Lovely post~ thank you for the tea-cup gift suggestion! Excellent post! I’ve telling friends for years not to squeeze their tea bags. I am also now going to buy a proper tea pot. I have another product question: Where do you buy your clear rock candy swizzle sticks? I can only find them in an assortment of colors, even online. Thank you!